The blind harpist Turlough O'Carolan is generally recognised to be Ireland's first great composer. Now his music is firmly established in the traditional repertoire and also crosses over into the classical repertoire. Seán Ó Ríada and The Chieftains made his music famous around the world. Most of his tunes are named after people or families (Planxty's), usually these were his patrons. Some of his most popular tunes include O'Carolan's Concerto, Carolan's Draught, Carolan's Receipt, Eleanor Plunkett, Fanny Power, George Brabazon, Hewlett, Mrs Mc Dermott, Lord Inchiquin, Planxty Irwin and Sí Bheag, Sí Mhór. 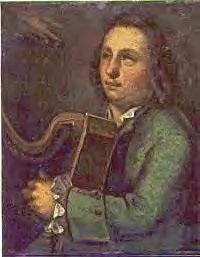 Turlough O'Carolan, also called Terence Carolan (born 1670, near Nobber, County Meath, Ireland, died March 25th, 1738, Alderford, County Roscommon), one of the last Irish harpist-composers and the only one whose songs survive in both words and music in significant number (about 220 of provable provenance are extant with an uncounted number apocryphally attributed). The son of an iron founder, O'Carolan became blind from smallpox at the age of 18. He was befriended by a Mrs. MacDermott-Roe, the wife of his father's employer, who apprenticed him to a harper and supported him for the three years of his training, then gave him money, a guide, and a horse. As an itinerant harper, he traveled widely in Ireland. Although never considered a master performer, he was highly regarded as a composer of songs and improvised verse. His tunes appeared widely in 18th-century collections. See Douglas Gunn's Home Page and the Douglas Gunn Ensemble.